Mon., 23 Sep. - Wed., 2 Oct. Sat., 14 Sep. - Mon., 16 Dec. Sun., 18 Aug. - Fri., 30 Aug. 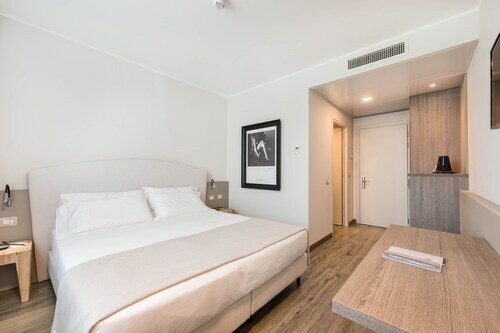 Situated near the airport, this hotel is 2.8 mi (4.5 km) from Equestrian Sporting Club Paradiso and 3 mi (4.8 km) from Museo Nicolis. Verona Arena and Veronafiere are also within 6 mi (10 km). Villafranca di Verona Dossobuono Station is 5 minutes by foot. 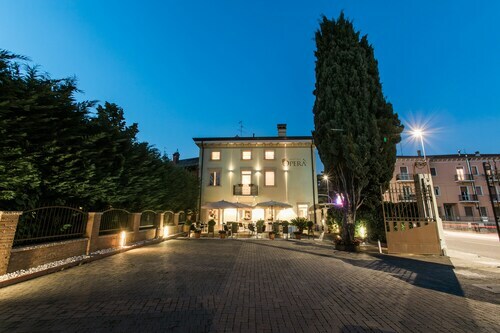 This family-friendly Villafranca di Verona hotel is located near the airport, within 3 mi (5 km) of Museo Nicolis and Equestrian Sporting Club Paradiso. La Grande Mela Shoppingland and Castello Scaligero are also within 6 mi (10 km). Villafranca di Verona Dossobuono Station is 20 minutes by foot. 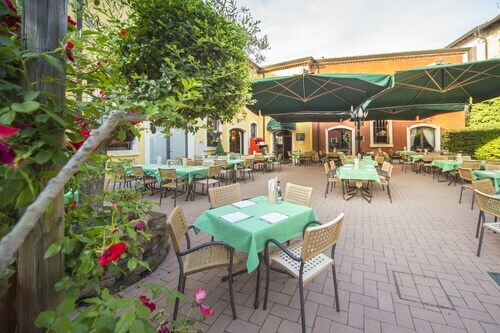 Situated near the airport, this hotel is 2.3 mi (3.7 km) from Museo Nicolis and within 6 mi (10 km) of Veronafiere and Equestrian Sporting Club Paradiso. Verona Arena and Juliet's House are also within 9 mi (15 km). Villafranca di Verona Dossobuono Station is 21 minutes by foot. 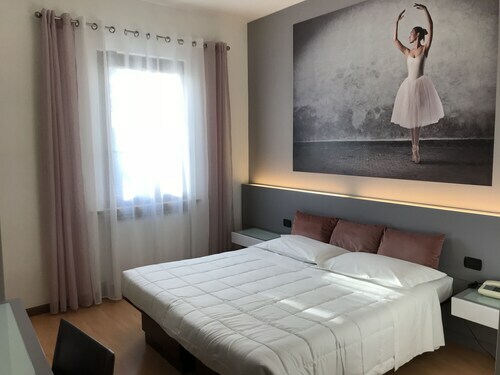 This family-friendly Sommacampagna hotel is located near the airport, 1.1 mi (1.8 km) from Equestrian Sporting Club Paradiso, and within 6 mi (10 km) of La Grande Mela Shoppingland and Golf Club Verona. Museo Nicolis and Veronafiere are also within 6 mi (10 km). 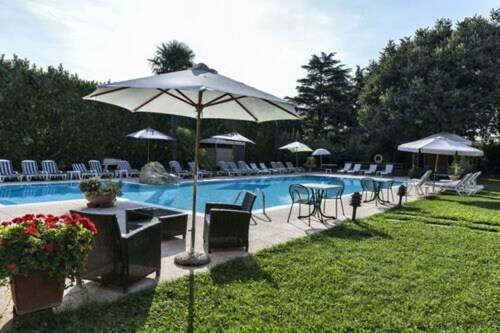 Situated near the airport, this spa hotel is 0.8 mi (1.3 km) from Equestrian Sporting Club Paradiso and within 6 mi (10 km) of Veronafiere and La Grande Mela Shoppingland. Golf Club Verona and Museo Nicolis are also within 6 mi (10 km). Situated near the airport, this hotel is 2.8 mi (4.6 km) from Equestrian Sporting Club Paradiso and 2.9 mi (4.7 km) from Museo Nicolis. Verona Arena and Veronafiere are also within 6 mi (10 km). Villafranca di Verona Dossobuono Station is 5 minutes by foot. Situated near the airport, this hotel is 2.9 mi (4.6 km) from Equestrian Sporting Club Paradiso and 2.9 mi (4.7 km) from Museo Nicolis. Veronafiere and Juliet's House are also within 6 mi (10 km). Villafranca di Verona Dossobuono Station is 6 minutes by foot. 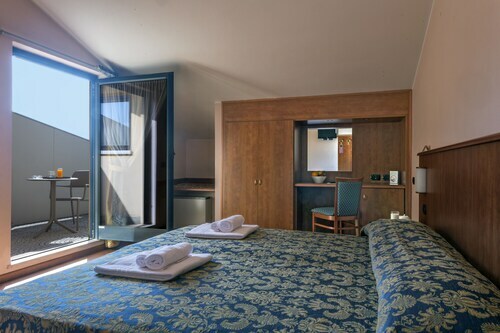 Situated near the airport, this hotel is 2.7 mi (4.4 km) from Equestrian Sporting Club Paradiso and 3 mi (4.9 km) from Museo Nicolis. Verona Arena and Veronafiere are also within 6 mi (10 km). Villafranca di Verona Dossobuono Station is 7 minutes by foot. Question : How much time do people spend in Verona? Answer : The average time spent in Verona by travellers from Toronto is 17 days. Question : What is the cheapest airline flying from Toronto to Verona? Answer : Air Canada is the leader in keeping prices down for their passengers over the next three months. Fares are being booked at just $944, which is a steal when compared to the high-end bookings of $1,145. Question : How much is a plane ticket to Verona (VRN) from Toronto (YYZ)? Cost can range from $944 to $1,145, prices for YYZ to VRN change much less than the majority of routes from Canada. Remember, booking ahead can save you money you can use to treat yourself while on your trip. And who doesn't like to treat themselves? Answer : Cost can range from $944 to $1,145, prices for YYZ to VRN change much less than the majority of routes from Canada. Remember, booking ahead can save you money you can use to treat yourself while on your trip. And who doesn't like to treat themselves?